LANdroid Wireless Battle Net | OhGizmo! Ever wish that your wireless network could follow you wherever you went? Yeah, so does the US Army. 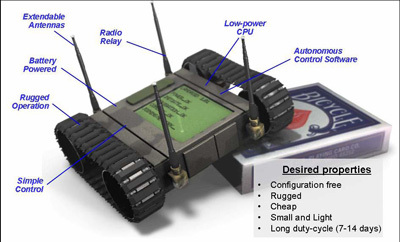 DARPA‘s LANdroid is a palm-sized, totally autonomous network router on cute little tank treads. It’s designed to be used in urban environments which have all sorts of inconveniently placed buildings that block more conventional wireless access points. These little guys are actually designed to be disposable; the idea is that they get dropped by advancing troops, whereupon they wander around at about half a meter per second until they find the most effective place to act as a network node. The bots work together to cover “shadowed” and indoor areas, and if one of them gets blown up, the rest will move themselves to keep the network operational. The details are trickier than it might seem… For example, the bots will be powered by disposable batteries, so power management will definitely be an issue, especially in a package that can’t be heavier than 1 kilo or larger in volume than 1 liter. The final product should only cost $100 per bot at small production volumes (i.e. 1000 units). This concept is a public solicitation by DARPA, which means that they don’t have one of these yet, but they really want one (and so do I). 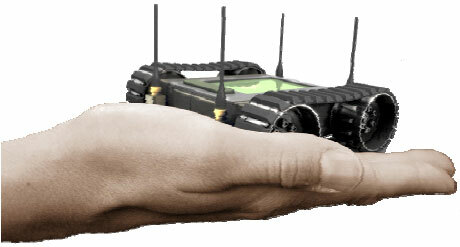 If you think you can put one together, proposals are due to DARPA by August 16.